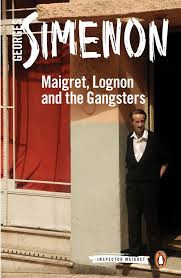 Maigret, Lognon and the Gangsters, Penguin’s English translation of Simenon’s Maigret, Lognon et les gangsters, will be available through Amazon.uk as of January 5, 2017 in both paperback and Kindle editions. Note that neither of these editions will be available through Amazon’s USA and Canada facilities until August 1, 2017 although they can be shipped from the UK across the Atlantic at relatively low cost. Fortunately, the January 5, 2017 release date still holds for many other Amazon sources as follows: Australia Kindle; Brazil Kindle; France Kindle; Germany Kindle; India Kindle; Italy paperback and Kindle; Japan Kindle; Netherlands Kindle; Spain paperback and Kindle. Unfortunately, the later August 1, 2017 release date does pertain at these remaining Amazon sources: China paperback; France paperback; Germany paperback; Japan paperback; Mexico paperback and Kindle. To facilitate searching for the book at other online, bookstore, and library sources, the ISBN-13 for this new edition is 978-0241250662. Maigret, Lognon et les gangsters originally appeared in 1952. The English translation Inspector Maigret and the Killers appeared in 1954 with a title switch to Maigret and the Gangsters in reissues from 1974 on. Its first translator was Louise Varèse, but now the translator is William Hobson. This work was the 67th in Simenon’s original order of publication and is the 39th in Penguin’s modern series of translations. It appealed to me for these features in particular: it portrays several American gangsters and at least one law enforcer in action in Paris. It shows Maigret working in close relationship with his associate Lucas. Lognon, with whom Maigret is often at odds, of course plays a very prominent role, so one gets much more insight into his character. In fact, an appearance by Madame Lognon informs and one sees Lognon (among others) earn sympathy from Maigret. Plus one gets another chance to explore whether Inspecteur Malgracieux AKA Inspecteur Malchanceux is a victim of his own personality or plain old bad luck, a challenge that makes him one of my favorite characters in the Maigret series.